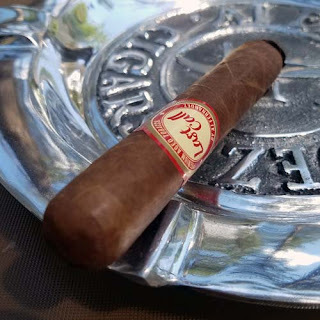 Here we are, number six, the final cigar of this newly released series from La Aurora Cigars, the Mid-Atlantic exclusive Corona. These new Coronas are a copy of the Preferido line in every way, except size. Just like the previous five cigars this La Aurora Maduro Corona has impeccable construction. It's covered in a thick and hearty, dark Maduro colored wrapper. The wrapper itself has a bit of tooth, very fine veins and it's rolled over the binder with seamless skill. From the cold foot there's a nice aroma of cocoa and after clipping the triple cap, the free draw has the flavor of chocolate covered raisins. Nice. After toasting and lighting the foot the medium bodied flavor of pure cocoa hits you right up front. As the sharp burn line moves up the cigar there are added flavor notes in the first half of toast and molasses. Around the half way point the body shifts into the full range plus there are new flavors of white pepper, brown sugar and even some floral notes. 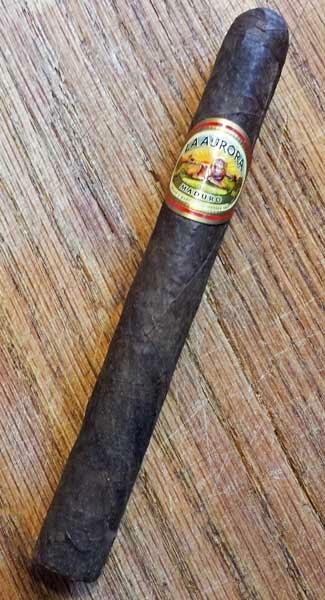 The La Aurora Maduro Corona finishes it's fifty minute burn with a tasty burnt mocha flavor mix. There are six different wrappers in this release meaning that sadly, this the last in a six part series. La Aurora Cigars are distributed by Miami Cigar and Company.